Dmitry Kuznetsov saw this complex display in Yuzhno-Sakhalinsk on 1 April 2007. The vertical arrows in the photo denote the Wegener arc and the horizontal arrows point at faint helic arc. Dimitry described also subanthelic arc, but it is located outside the photo. More photos are also available ( 1 ). Interesting projection... Must have been quite a sight. I wonder what the anthelic region looked like. Diamond dust, right? This looks like a high cloud display. See the lower tangent arc. So, it is exceptionally good high cloud display. The projection is great. Would be worth learning this technique. It is like a painting of historical display. Thank you for high appreciation of the photo! This is a 2-level panoram assemled in PTGui and reworked (generally warped) in Photoshop to display the visual impression more adequately. Thus, this is not a definite projection (although I used spherical projection in PTGui), just a manually adjusted approximation of view. (view angle about 180 degrees lateral and 90 degrees vertical). Dmitry you have a wonderful display there I saw my first wegener arc in early 2006 and like yours it had heliac arc. 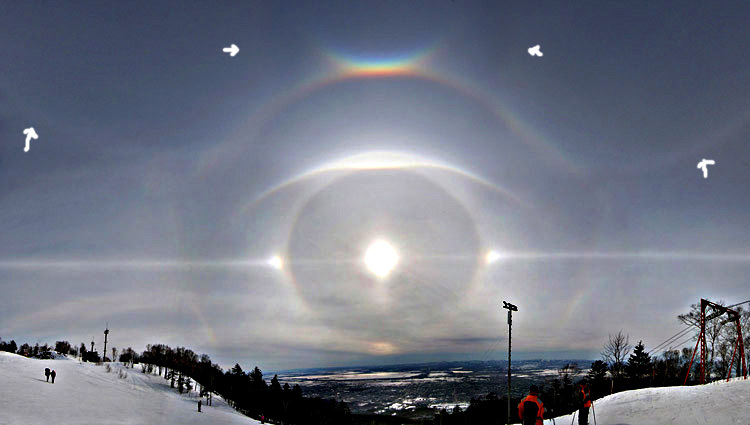 The last great halo I got in Ohio USA was the great March 23rd elliptical halo display that went on for over two hours. I await to see more! !